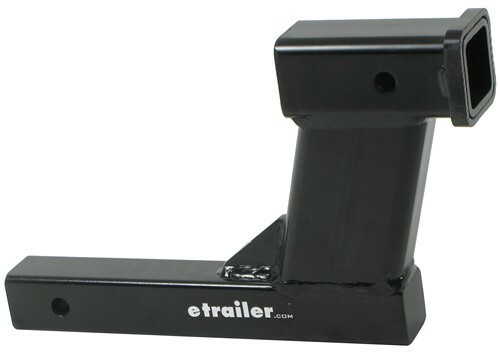 Make up for the height difference between your RV and towed vehicle with this hitch adapter. Provides either an 8" drop or an 8" rise. Solid shank provides strength and durability. 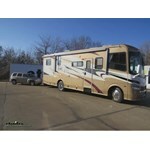 Call 800-298-8924 to order Roadmaster accessories and parts part number RM-048-8 or order online at etrailer.com. Free expert support on all Roadmaster products. Guaranteed Lowest Price and Fastest Shipping for Roadmaster High-Low Adapter for Tow Bars - 2" Hitches - 8" Rise/Drop - 10K GTW, 400 lbs TW. Accessories and Parts reviews from real customers. 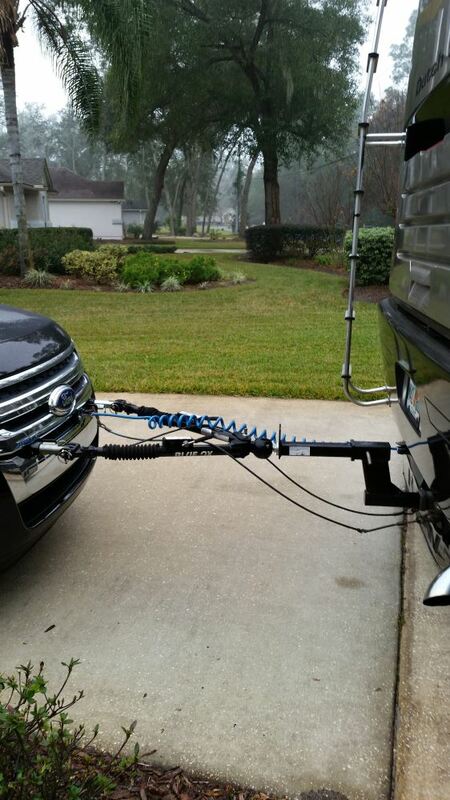 Make up for the height difference between your RV and towed vehicle with this hitch adapter. Provides either an 8" drop or an 8" rise. Solid shank provides strength and durability. Note: This adapter is designed to flat tow a vehicle only. Do not use to tow a trailer. 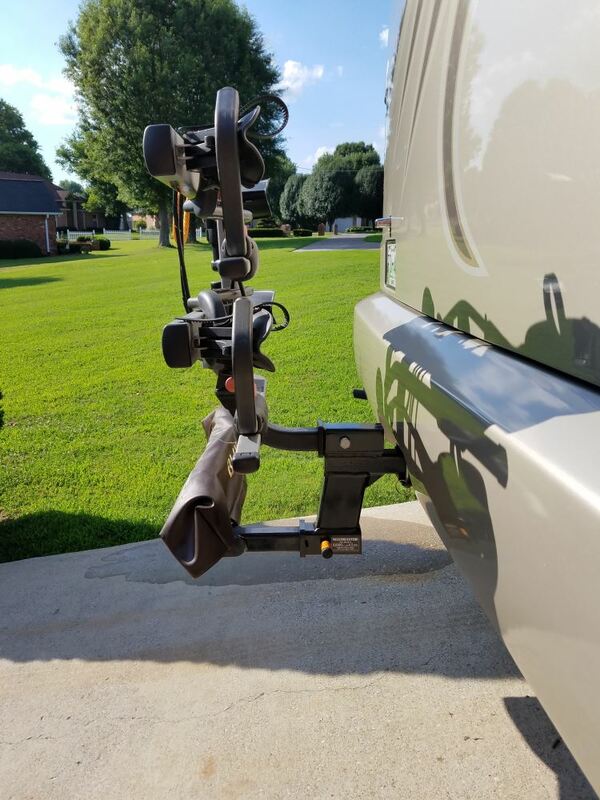 When using with a hitch-mounted accessory, such as a bike rack or cargo carrier, the tongue weight of your hitch will be reduced by at least 50 percent. 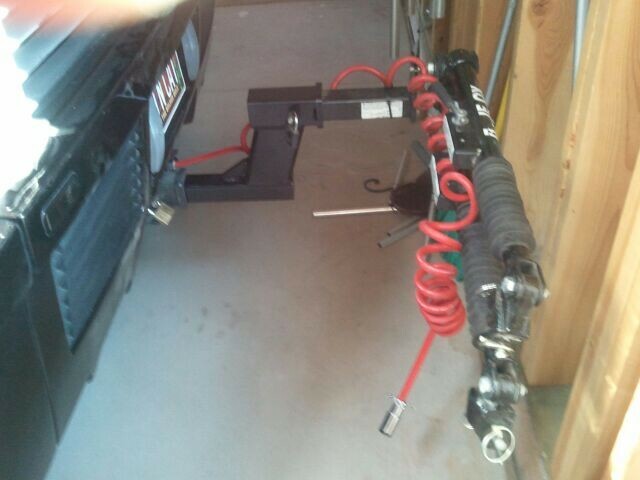 Most tow systems require some sort of hitch accessory to either raise or lower the tow bar to an appropriate level. 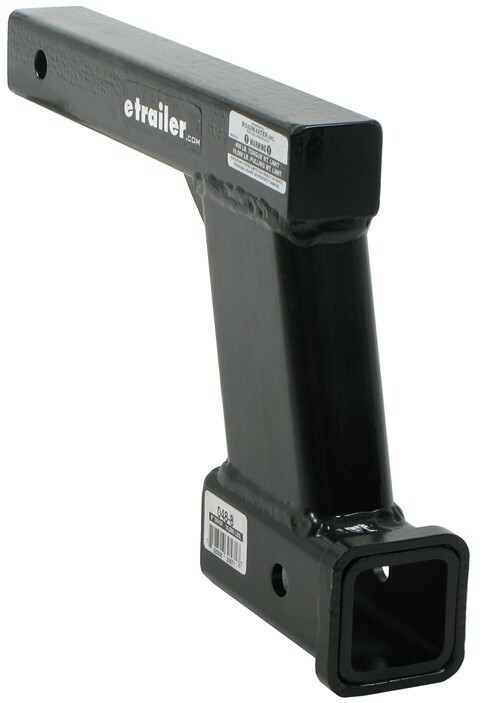 The "Safe Zone" for a motor-home-mounted tow bar ranges from 3" above level to 3" below. Car-mounted models must be absolutely level. 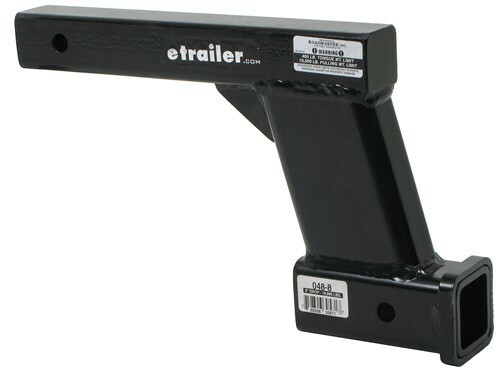 This high-low adapter can provide you with the necessary drop or desired rise to achieve a level tow bar setup. Today we'll be reviewing RM-048-8, this is the Road Master High Low Hitch Adapter, traded at 10,000 pounds when it comes to weight capacity. It's going to have maximum ton weight of 400 pounds. This is designed to fit a two inch by two inch trailer hitch. The opening on the receiver itself is a two inch by two inch opening. If we take a measurement of the drop measuring from the top edge of the receiver tube to the top edge of the receiver tube it's going to give us a drop of eight inches. This can be used in the rise or dropped position, so if you flip it over to the rise position it's going to also give you an eight inch rise. Let's go over a few measurements real quick. We're going to measure from the center of the hitch pin hole to the closest point here on the angle brace. That measurement is going to give us a measurement of five and a half inches. If we measure from the center of the hitch pin hole to the closest point here, that part that's welded on. That's going to give us a measurement of three and a half inches. The distance from one pin hole to the other, center on center, is going to give us a measurement of nine and seven eighths of an inch, and up top here we're going to take a measurement from the center of the hitch pin hole to the back of the shank, and that's going to give us a measurement of two inches. If you we're to go at a straight angle from one pin hole to the other, a forty five degree angle, you're going to come up with a measurement of about twelve and a half inches. You can see here on the back side that this is a solid shank, it's a solid piece. It is going to require a five eighths inch pin and clip or a hitch pin and lock. 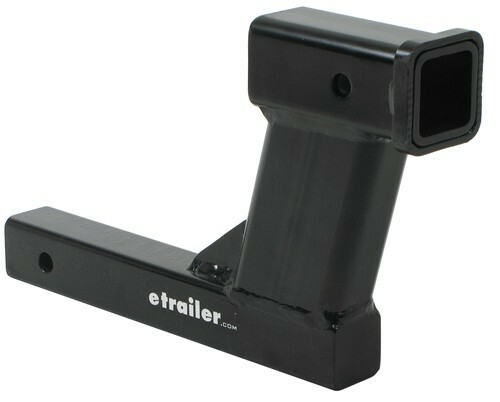 We do sell those at etrailer.com, you can go to our website and type in part number PC3, it's going to refer you to a great option that's going to be a five eighths inch pin that's going to come with a clip. Please keep in mind that this is not for use with any type of trailer, this is designed for use with tow bars only. Again, it's going to give us a weight capacity of 10,000 pound with a maximum ton weight capacity of 400 pounds. That's going to do it for today's review of part number RM-048-8, this is the Road Master High Low Hitch Adapter. Order: RelevanceNewestRating - High to LowRating - Low to High Make up for the height difference between your RV and towed vehicle with this hitch adapter. Provides either an 8" drop or an 8" rise. Solid shank provides strength and durability. Be aware that the adapter has a 400 lb tongue weight capacity. This means that the dirt bike and the carriers combined weight cannot exceed 400 lbs. I feel that the design limit for the torque this attachment imparts on the motorhome trailer hitch exceeds the design limit of the motorhome hitch. A few hard stops seem to have bent the motorhome hitch a little. I am towing a 4k lb vehicle with a 2015 Winnebago Vista. Thanks for the feedback. It is always that the lowest rated component of the towing system be the determining factor for any towing situation. I looked on-line and it looks like your 2015 Winnebago Vista could have been equipped with a hitch rated for up to 5K from the factory. Please confirm that the hitch is rated appropriately for the vehicle you are towing. Additionally a supplemental braking system like the Roadmaster Even Brake # RM-9400 is recommended. If you do have a braking system it may need some adjustments for more effective braking of your toad. I have also included a link to one of our help articles that explains all the individual components of a flat towing system for your reference. 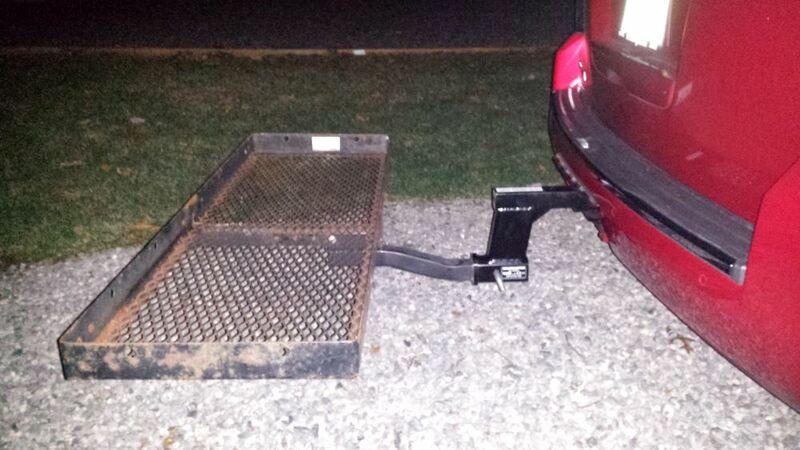 Be aware that using an extender like the # RM-048-8 will lower the tongue weight capacity of your hitch by 50 percent. Because the load has been moved further away from the receiver, more leverage is being applied to the hitch. One year later and still very happy with my purchase as well as the service I had received. Great stuff! The down is still meeting my needs and is serving very well. Great .. Just Watch your Weight Ratings. The Roadmaster High-Low Hitch Adapter, # RM-048-8, is only designed for tow bar applications. I do have another, more cost effective solution. You could use the Curt Multipurpose Ball Mount, # D210. Though it is designed to tow while carrying a cargo carrier or bike rack, you can use it to just carry a cargo carrier. The rise on the receiver is not as high as the High-Low adapter, but the receiver portion has a 350 lb tongue weight. 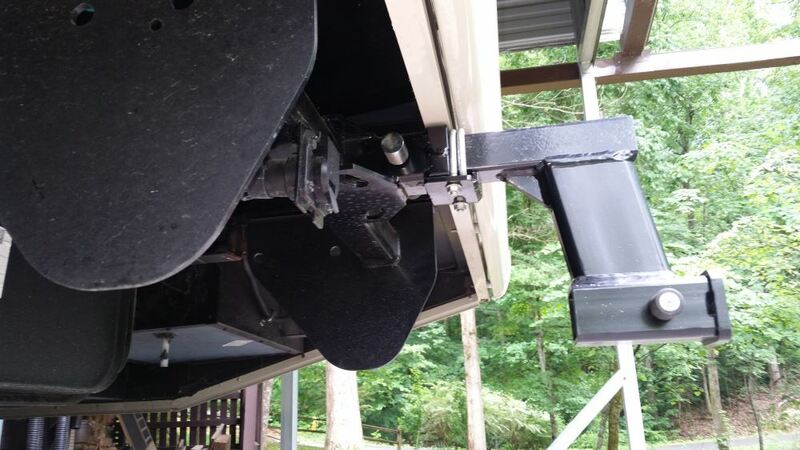 According to Blue Ox and Roadmaster, you want to use a High/Low adapter that would place the tow bar's attachment to the hitch no more than 3 inches above or below level. Anywhere WITHIN that range would be perfectly acceptable. The length from the center of the hitch pin hole to the angled brace is 4-1/2 inches. The measurement from the center of the hitch pin hole to the center of the receiver pin hole is 10-3/4 inches. The distance from the center of the hitch pin that will go into your RV hitch to the back of the receiver tube is right at 7-1/4 inches. I attached a review video for this product for you to check out as well. Can High-Low Adapter be Used for Towing a Car Dolly Behind an RV? You can use a high low adapter like part # RM-048-8 to lower the hitch opening but you should note that it will lower the capacity of the hitch by 50 percent. 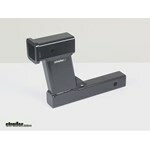 I attached a picture of the Curt Hitch part # C31023 installed and you can see it sits a bit closer to the ground. This might be your best option since it wouldn't require the use of the high low adapter. Since ground clearance is limited and the part # RM-048-8 will get you within the 3 inches up and down of being level that would be your best option. I attached a help article on how to pick out the correct high-low adapter as well. Yes, the Blue Ox Hitch Receiver Immobilizer II # BX88224 is compatible with the Roadmaster High-Low Adapter # RM-048-8 that you referenced. These two products would work well together. I attached review videos for both for you to check out as well.